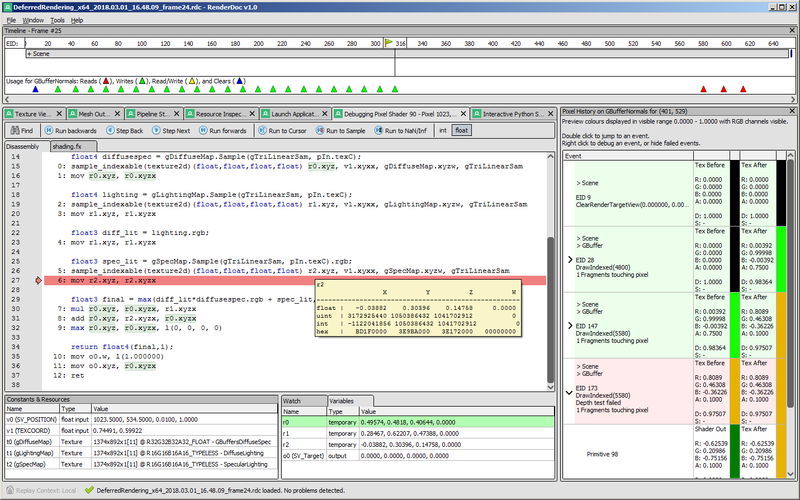 RenderDoc is a free MIT licensed stand-alone graphics debugger that allows quick and easy single-frame capture and detailed introspection of any application using Vulkan, D3D11, OpenGL & OpenGL ES or D3D12 across Windows 7 - 10, Linux, Android, Stadia, or Nintendo Switch™. I work on RenderDoc myself and you can always contact me with any problems or comments. I'll respond to you directly and personally, and I'm used to helping people with private or NDA'd projects. RenderDoc is 100% open source and development all happens on github. Check out the source and see how any feature is implemented, report a bug you've found, or request a new feature or improvement. Usability matters. Tools should have a low barrier to entry and be easy to use and understand. RenderDoc makes the process of getting started as smooth as possible, and simplifies common workflows. RenderDoc supports Windows 7, 8.x, 10, Linux, Android, and Stadia for capture and replay out of the box. Nintendo Switch™ support is distributed separately for authorized developers as part of the NintendoSDK. Captures are portable between different platforms and hardware. On top of being able to modify the source to change or customise behaviour, RenderDoc embeds the python runtime for progammatic access to frame captures. 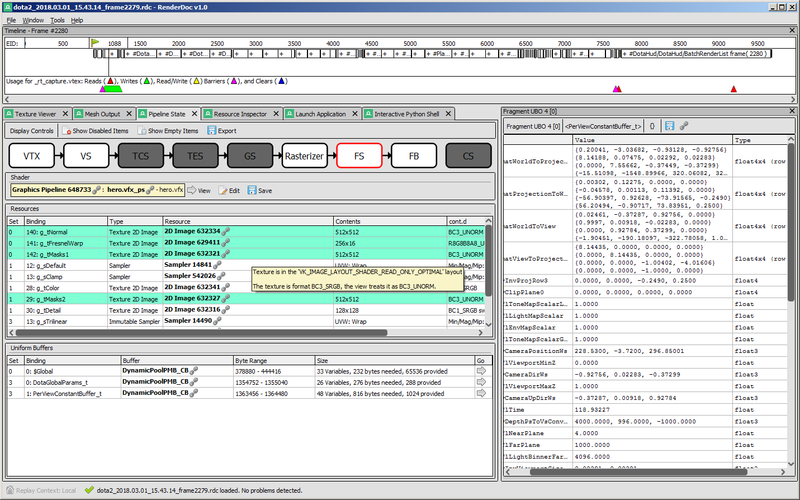 RenderDoc is the debugger of choice for many people within the game industry, academia, and hobbyists. Engine-level integration ships in Unity, and in Unreal. 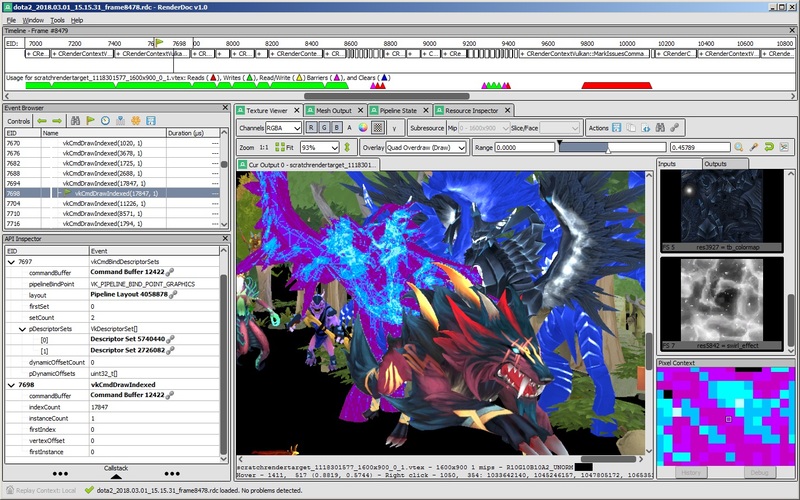 RenderDoc has been one of the most dependable PC graphical debugging tools for us over the years. Best thing, it's open source, you can roll-out your own features and contribute fixes. Most of my debugging usually ends with, "I should have looked at this in RenderDoc earlier". RenderDoc is an absolute life saver. Not only has it made graphics debugging for both DX11 and DX12 quicker and easier, but the simple integration API has made it invaluable for testing! RenderDoc v1.0 is here! Android support for GLES & Vulkan, Qt UI on windows, and many other improvements. Qt UI shipping on Windows with many improvements. Android Support for both GLES and Vulkan. Internal serialisation refactor allowing flexible import/export of RenderDoc captures. 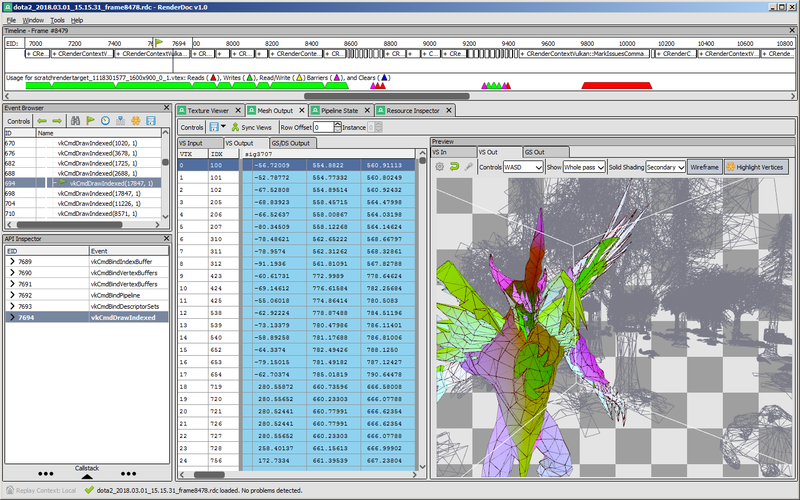 Centralised resource inspector with details of all resources in a capture. The fully nitty-gritty and all details are available over on the GitHub release notes, so go check it out and download the build. As always if you have any questions, comments, or any other kind of feedback you can always reach me by email or on twitter or in the IRC channel. Don't hesitate to send me a message as I'm always happy to hear from RenderDoc's users. Today is the 5 yr anniversary of the first commit to RenderDoc's original git repository. I've written some nostalgic words about the early days before its first public release. Vulkan has a lot of really nice concepts, but one that hasn't had as much attention until now is the layer system that's built into the API ecosystem. I've written this post with a specific target audience in mind, namely those who have a good grounding in existing APIs (e.g. D3D11 and GL) and understand the concepts of multithreading, staging resources, synchronisation and so on but want to know specifically how they are implemented in Vulkan. So we end up with a whirlwind tour of what the main Vulkan concepts look like. A series of posts aimed at a technically minded average person, who wants to know more about how modern graphics work. This won't teach you how to make anything and it doesn't assume much prior knowledge, but hopefully it will explain the concepts at least.